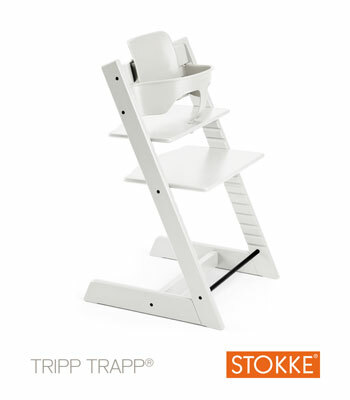 We haven't had a giveaway for quite some time so who would like to win this package of Stokke® goodies? We have a white Stokke® Tripp Trapp® with baby set, one of our super cute 'I'Heart Stokke®' baby T-Shirts and an 'I Heart Stokke®' reusable shopping bag to give away to one lucky person. The Tripp Trapp® chair, created in 1972 by the designer Peter Opsvik, has never been bettered. In 1972, revolution was a fact. Back then no one had seen anything like the Tripp Trapp®, and almost 40 years later it is still unique: it's the only chair that can take you from baby to adult, keeping you secure and comfortable all the way.... and it looks pretty cool too. All you have to do to enter is sign up for our mailing list using the form below. One entry per person please and over 18's only. Entry closes at midnight (GMT) on 10/07/11. Good Luck! Before you go... why don't you join our Facebook community?